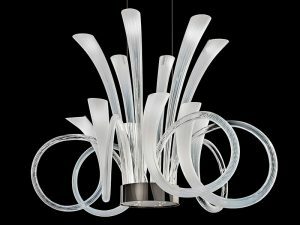 This graceful modern Murano chandelier is from the latest Murano Collection. It breathtakingly combines modern and elegance. This chandelier is large and imposing, and will work best in a busy room, such as a family room or dining room. Hung in a foyer, it makes a bold, yet tasteful, statement to any visitor or guest. 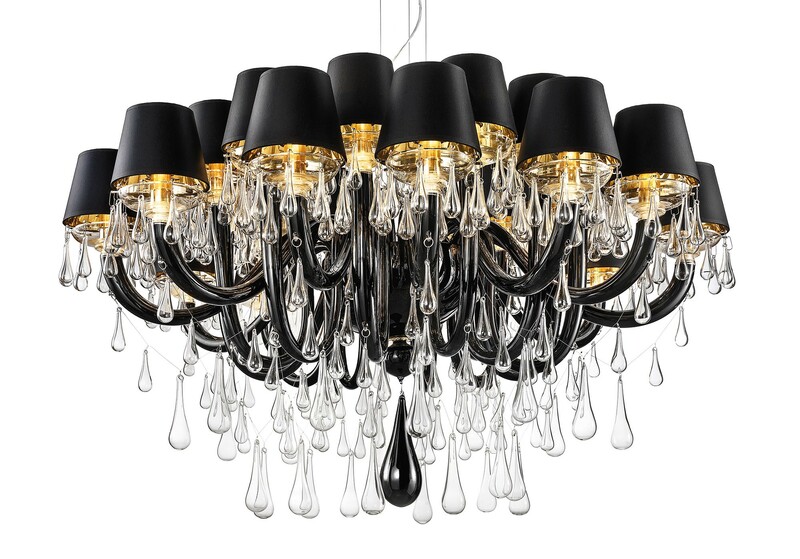 The black, gold, and clear glass will coordinate with any modern décor, and this modern Murano chandelier can also be used as the focus or centerpiece to anchor a room. The matte black lampshades are painstakingly handcrafted of silk, and have a polished gold lining. The graceful arms and raindrop crystals are formed from black and clear Murano glass, the bobeche cups are constructed of clear glass and gold leaf, and any metal components are presented in a tasteful gold tone. 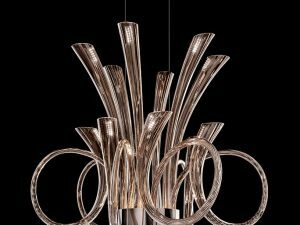 This modern Murano chandelier projects an atmosphere of warm hospitality and luxury. 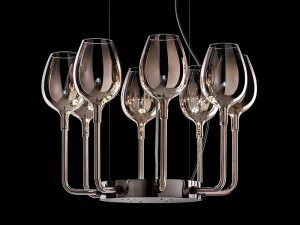 Anyone encountering this beautiful chandelier will know that they are in the presence of good food, good wine, a pleasant visit, and a luxurious home. Color: Black and clear glass, bobeche in clear glass + gold leaf with gold structure and silk shade in black internally polished gold. Glass available in the following colors: cappuccino and clear glass, Milk-white and clear glass with chromed structure and silk shade in white. 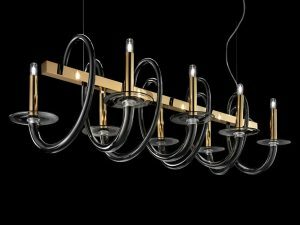 Modern chandelier DMGOUTTE0S24K is also available in 8, 10, 12, 16 and 24 lights. Also available in custom size, glass color and custom metal finishes upon your request.